"An unusual sounding recipe that turns people off until they taste it, then they love it." In a small bowl, mix together the mayonnaise, sour cream, red wine vinegar, sugar, milk and poppy seeds. Set aside. Divide the lettuce into 6 individual salad bowls. 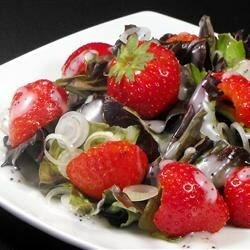 Sprinkle strawberries over the lettuce, and garnish with onion slices. Pour dressing over salads just before serving. We LOVED this salad!!! I didn't have poppy seeds on hand. The dressing would've looked pretty with them in. Added some chopped pecans for crunch. Loved the dressing used 1/2 of the sugar called for and it is still very sweet. did everything as instructed with the exception of reducing the sugar to 1/4 cup and this was a wonderful salad! would have definitely been too sweet with more sugar. OUTSTANDING! You wouldn't expect the flavors to blend,but when I made this, everyone wanted the recipe!! I was surprised how good this was, and the dressing was good as well. The best salad ever!!!! I always make this for bbq's and it's always gone.